Tm:YAG finds its application in urology, laser radar and other atmospheric sensing applications due to its operating wavelength at 2013 nm. 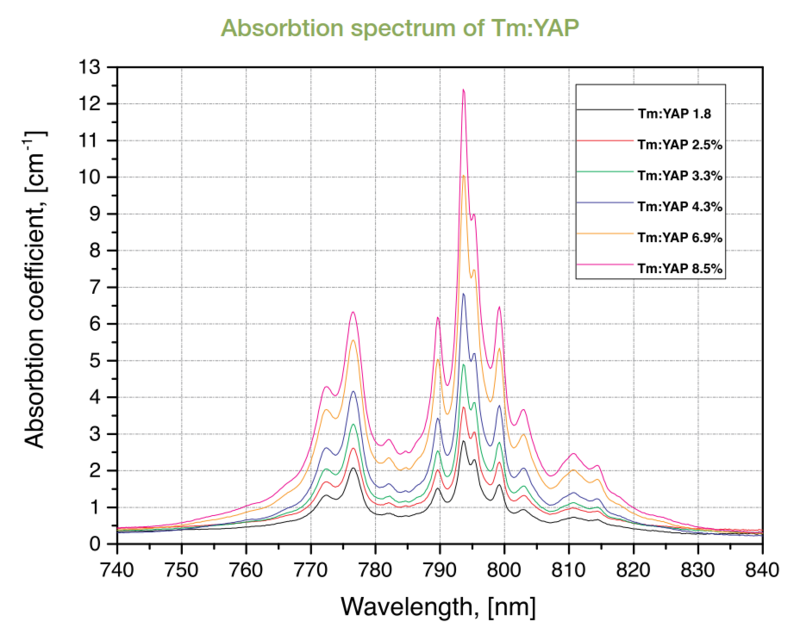 The absorption band peaking at 786 nm is suitable for pumping by semiconductor diodes. Tm:YAG has a long fluorescence lifetime, which is appreciated for the high-energy Q-switched operation. The efficient cross-relaxation with neighboring Tm ions produces two excitation photons in upper laser level for one absorbed pump photon. It provides high quantum efficiency and reduces thermal loads. Tm doping concentration 1% - 8% at. Tm doped crystals embrace several attractive features that nominate them as the material of choice for solid-state laser sources with emission wavelength of around 2 microns. There is a self-quenching mechanism between the 3H4 and 3F4 levels that produces two excitation photons in the upper laser level for one absorbed pump photon. This makes the laser potentially very efficient with high quantum efficiency. 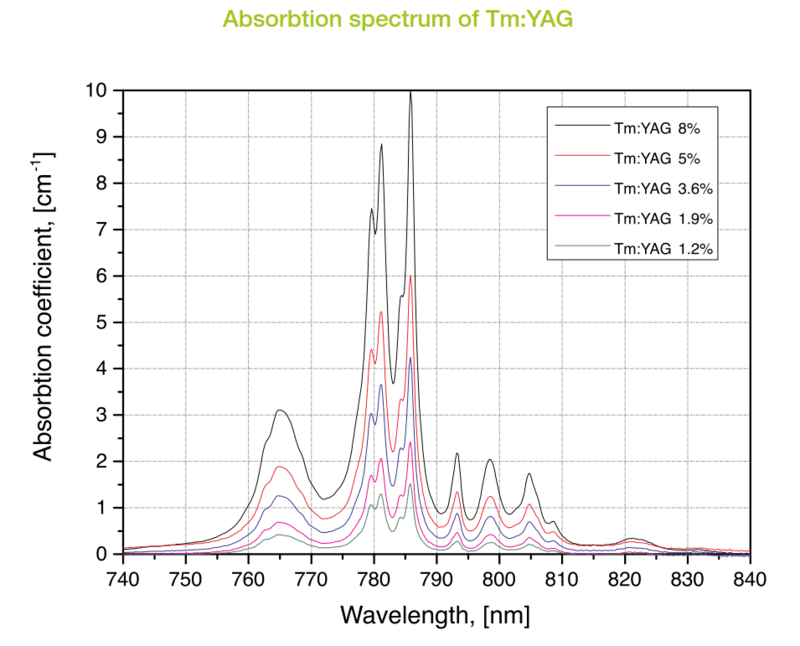 Yttrium aluminium oxide YAlO3 (YAP) is an attractive laser host for thulium due to its natural birefringence combined with good thermal and mechanical properties similar to those of YAG. 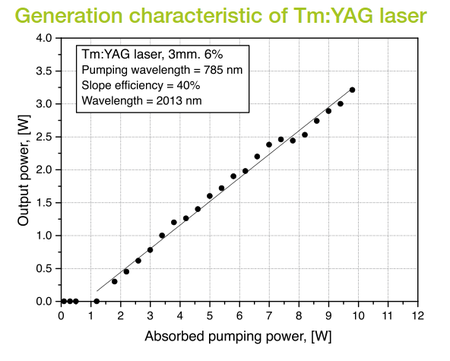 The emission cross-section of thulium in YAP is twice as high as in YAG and the peak of absorption at 793 nm is suitable for InGaAs diode pumping. 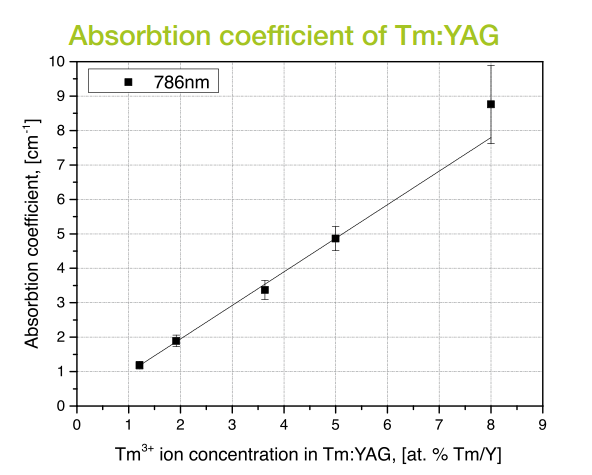 The 4-nm wide absorption peak of Tm:YAP is broader compared to Tm:YAG, resulting in better tolerance to pump diode wavelength variations. 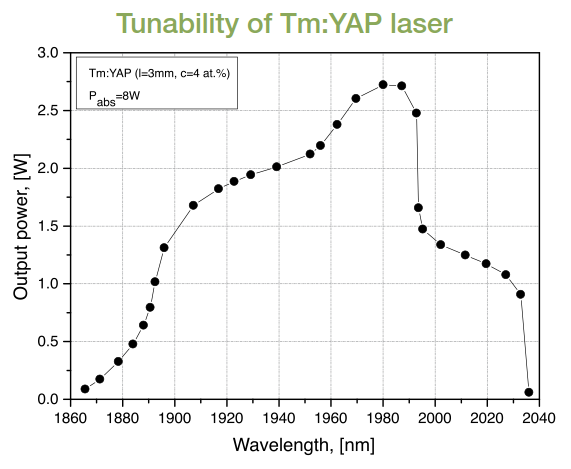 Tm:YAP can be tuned from 1870 nm up to 2030 nm with the maximum at 1985 nm.